Fisher-Price brings the excitement of Power Wheels indoors so young drivers can take a ride with Thomas. Specifically designed for toddlers, it offers toddler-friendly features including easy-to-use push-button operation, comfortable footrests and six volts of battery power for a fun but safe 1 mph forward speed on track and up to 2 mph off track. 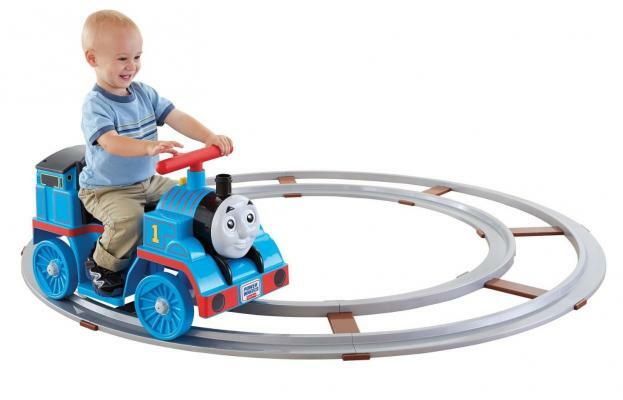 Get started by putting together the easy-to-assemble track and letting kids ride Thomas around & around. Then, when they're ready to steer, simply take the train off the track for limitless adventures. Thomas fans can add to the fun by pressing the yellow whistle for phrases and sounds from their favorite blue engine.